This month marks the fifth anniversary of the #BlackLivesMatter hashtag, which was first coined following the acquittal of George Zimmerman in the shooting death of unarmed black teenager Trayvon Martin. 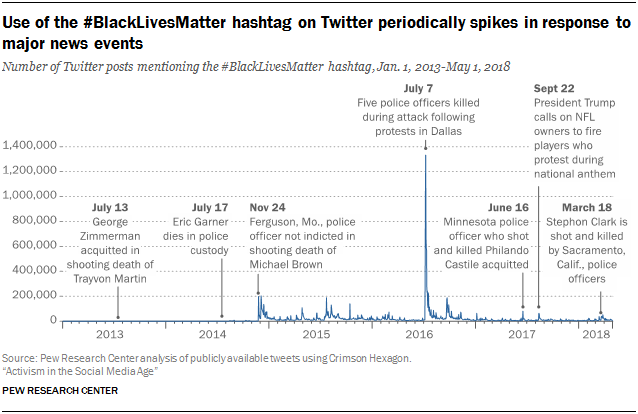 In the course of those five years, #BlackLivesMatter has become an archetypal example of modern protests and political engagement on social media: A new Pew Research Center analysis of public tweets finds the hashtag has been used nearly 30 million times on Twitter – an average of 17,002 times per day – as of May 1, 2018. 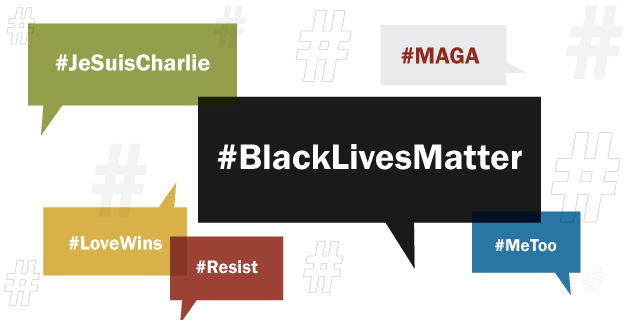 The rise of the #BlackLivesMatter hashtag – along with others like #MeToo and #MAGA (Make America Great Again) – has sparked a broader discussion about the effectiveness and viability of using social media for political engagement and social activism. To that end, a new survey by the Center finds that majorities of Americans do believe these sites are very or somewhat important for accomplishing a range of political goals, such as getting politicians to pay attention to issues (69% of Americans feel these platforms are important for this purpose) or creating sustained movements for social change (67%).